Yamana Gold has agreed to sell its Chapada copper-gold mine to Lundin Mining for a cool $1 billion. The company believes it is getting fair value for the asset, and will invest the proceeds mainly towards debt repayment. I break down the news and give my thoughts on the transaction. Yamana Gold (AUY) caught me a bit off guard Monday when it announced it has agreed to sell its Chapada copper-gold mine in Brazil to Lundin Mining (OTCPK:LUNMF) for total consideration of up to $1 billion. Under the terms of the agreement, Yamana will receive cash of $800 million at closing, and additional consideration of up to $125 million based on the price of gold, and a further $100 million payment if Lundin develops a pyrite circuit to optimize the operation. Yamana also nets a 2% NSR royalty on the adjacent Suruca gold project. Chapada is an open pit gold-copper mine in Brazil that has been in production since 2007. This is a low-cost operation that produced 121,003 ounces of gold and 129 million pounds of copper in 2018. According to the most recent reserve statement (year-end 2018), the deposit contains 4.5 million ounces of gold and 3.7 billion pounds of copper. Chapada is a pretty strong asset, and in the second quarter of 2018, a multi-phase plan was announced for further improvements. "The Company is focused on improving cash flows and returns on invested capital. In that context, the will be managed within the framework of the balance sheet objectives... monetization of certain assets or other strategic alternatives may ultimately provide additional flexibility to both the balance sheet and project timing." 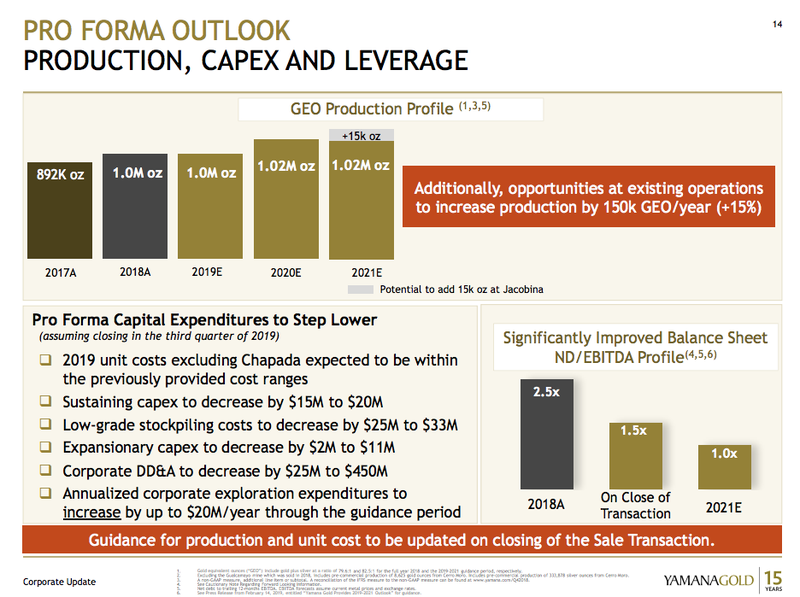 According to Yamana's previous 2019-21 outlook, expansion, sustaining and total exploration capital at Chapada is scheduled to hit $52 million this year; this figure doesn't include costs to add lower-grade ore stockpiles at the mine (an additional $57 million). Yamana also hasn't yet released the feasibility study for Chapada Phases 2 and 3 expansion, which were expected in mid-2019. But according to the corporate update, Chapada's planned "sustaining capital" expansion would cost a total of $240 million. By selling Chapada, Yamana will sees its 2019 sustaining capex fall by $15 million, long-term stockpiles cost of $25 million, expansionary capex of $2 million, and depreciation, depletion and amortization (DD&A) by $25 million. Yamana says it considered the upside of the planned expansion at Chapada versus this capital requirement. But it needs to strengthen its balance sheet and improve financial flexibility as it looks to advance its other projects (Cerro Moro, Canadian Malartic, etc.) and perhaps complete new deals that carry higher returns than Chapada. The one previous knock on Yamana was its debt and that was a main reason why I did not buy shares in the past. With the sale of its Chapada mine, the net debt figure of $1.66 billion will be reduced to approximately $800 million and could be reduced further with royalty payments and further payments from Lundin. The miner is also anticipating annual interest savings of at least $35 million from the debt reduction. 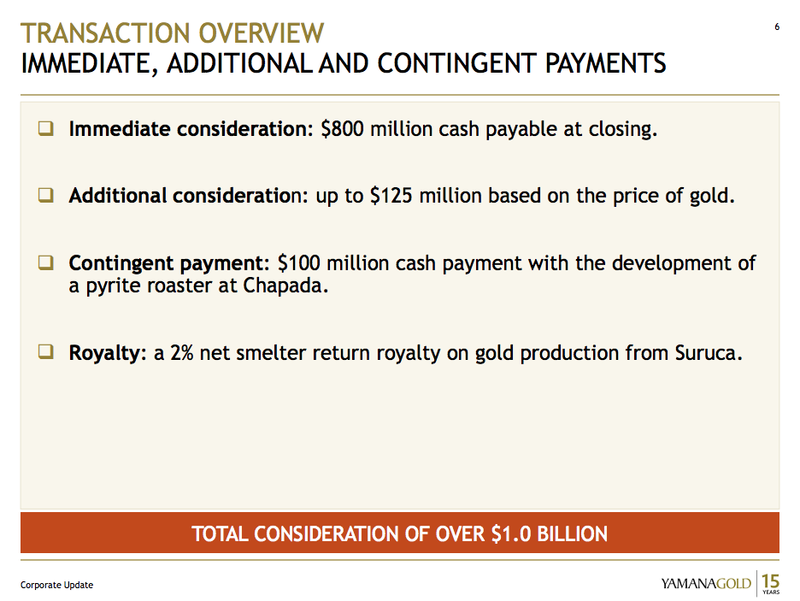 Another good part of this sale for Yamana that should not be overlooked is the 2% NSR royalty Yamana will get on the gold produced from the Suruca deposit. This sulphide deposit contains 762,000 ounces of gold reserves, but an additional 1.38 million measured and indicated resources, and it is open for expansion. Potential production is expected to exceed 120,000/oz per year, or approx. 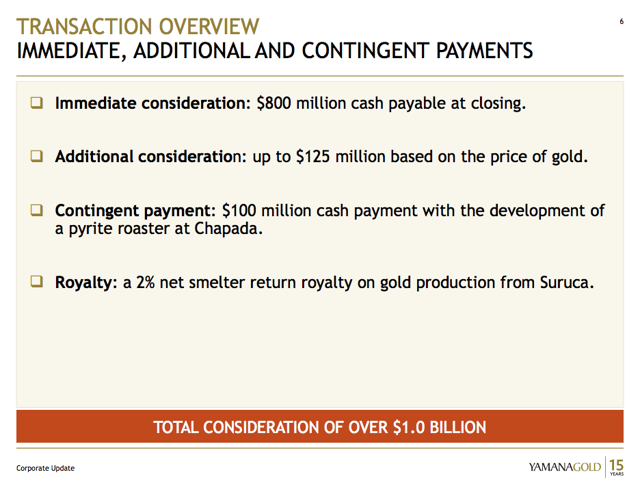 $3 million in royalty cash flow (at $1,300 gold). It can also look to monetize this royalty if it wants, selling it to a streaming/royalty company. Concurrent with the news release, Yamana has also announced a doubling of its annual dividend to $.04 per share (1.7% forward yield), and a share buyback program to purchase up to 5% of the company's issued and outstanding common shares. 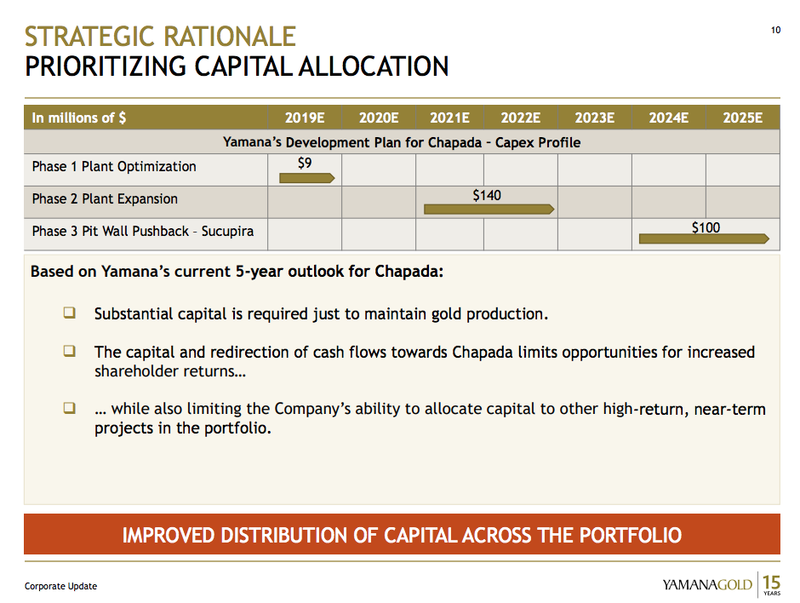 Yamana's production will obviously take a hit with the loss of Chapada, but it still has five high-quality gold mines. The biggest difference now is it's more of a pure gold/silver miner. By 2021, the company expects a small increase in gold equivalent production to 1.02 million ounces. However, several expansions are being considered at its various mines which could easily bump this up to 1.17+ million ounces. At Jacobina, the company is evaluating the possibility of increasing production beyond 150,000 ounces per year to as high as 170,000 ounces; at Canadian Malartic, the Odyssey and East Malartic deposits are key exploration targets for Yamana and its 50% JV partner, Agnico Eagle Mines (AEM). Further, the Cerro Moro mine will see a major drill program this year to test near-mine targets. Finally, the company will continue to work on technical studies for the massive Agua Rica project in Argentina, where it has partnered with Glencore (OTCPK:GLCNF) (OTCPK:GLNCY) and Goldcorp (NYSE:GG) to integrate the project with the existing infrastructure and facilities of Minera Alumbrera Limited (which will likely reduce capex requirements by a wide margin). A pre-feasibility study for the integrated project is due for 2019. A full feasibility study will then be released the following year. In case you are wondering, I believe the sale news is slightly positive for Sandstorm Gold (SAND), which owns a copper and silver stream on Chapada; the stream's terms are exactly the same following the takeover. Lundin is a larger company than Yamana ($5+ billion market cap, compared to $2.2 billion) and will definitely be investing in the expansion of this mine. I believe this mine sale is slightly bullish news for Yamana. The biggest question mark is how Yamana will invest its cash outside of the dividend raise and share buybacks. I tend to support share buybacks more than dividend raises, as I believe it's a more efficient use capital when a stock is undervalued. Yamana has stated that it can now be opportunistic with acquisitions, especially in a down market for gold. But it appears it will be pretty selective in that regard. It will look for projects for which it has the technical expertise to develop and operate, and target after-tax returns of at least 15% (based on its weighted cost of capital), according to the release. I would expect the company to target mines in North and South America. 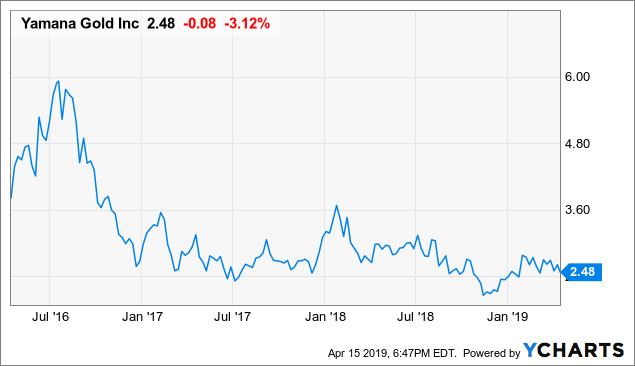 Yamana is no longer a growth stock, but that could change very quickly and that doesn't mean it can't and won't outperform peers. If you'd like to learn more about top gold and silver stocks, please consider joining The Gold Bull Portfolio. Subscribe now and receive exclusive access FULL ARTICLES that include deeper analysis into gold and silver miners, including insider buying updates and takeover targets. Get access to my real-life gold holdings, and trade alongside me if you'd like. Join our 24/7 live chat, where you can join our community of investors. Enjoy access to my top investment ideas in the gold & silver sector, which have outperformed the GDX and GDXJ for several years running. A free trial is available for a limited time only! Disclosure: I am/we are long AUY. I wrote this article myself, and it expresses my own opinions. I am not receiving compensation for it (other than from Seeking Alpha). I have no business relationship with any company whose stock is mentioned in this article.